Monday morning as I was rushing on the way to a VERY important meeting – with my doctor – I noticed a sign which got me laughing, because of the unintended message of the design, and gave me some material for a – this – blog article. Tuesday came and went before I had a chance to get the photo, and I was not in the area on Wednesday, so I made a plan to make a specific trip on Thursday, and lo and behold, when I arrived the sign in question was no longer there. DAMN! OK, so my thinking on the blog topic had to change – as it has had to on many issues this year, especially with reference to making money – and the change was the ‘topic’ to HOW DID I MISS IT!. An the then it dawned on me, I did not seize the day. Research has shown that, especially when we are busy or distracted, we do not take the time to LIVE life. We get so caught up in our daily lives that we forget to LIVE them. Like I found I need to, I am suggesting you SLOW down folks. Take the time to smell the roses, and enjoy life. Before you look around the sign will be moved and the opportunity lost. 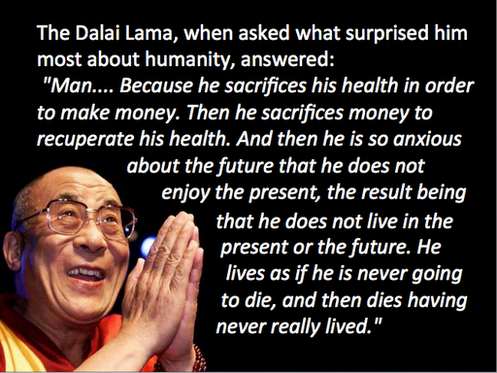 This is summed up brilliantly by the honorable Dalai Lama. This post is a ‘public interest’ post for all South African’s. Attached is what I believe to be the best, objective view of the e-tag system I have seen to date. It is written by Deon Botha of Botha Attorneys, and arrived via email. I am using it without prior authorization. Personally I do not believe in buying into ANYTHING that has to be SOLD so hard. Also wonder who is paying for all the SANRAL costs. The attached article states that SANRAL is STATE OWNED, but then how is it that the shares are held in Austria, as has been published. My advice – DO NOT REGISTER.